Royal Mail's will issue a miniature sheet to celebrate the wedding of Prince Henry of Wales to Ms Meghan Markle on 19 May. 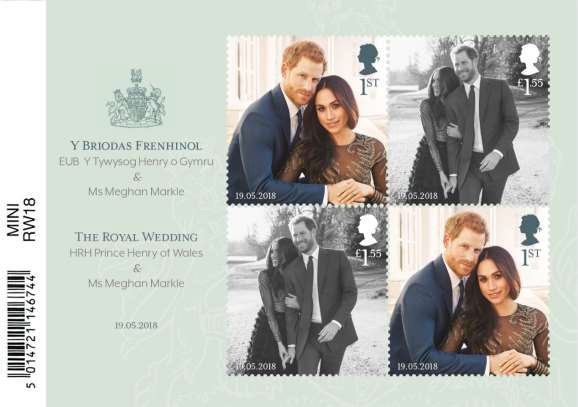 As with the issue for his brother's wedding in 2011, the stamps will be issued in a miniature sheet of 2 x 1st class and 2 x airmail rate, in this case £1.55. Designed by The Chase agency, the sheet is printed by International Security Printers in litho with PVA gum. Dimensions: 115mm x 89mm. The stamps are 35 x 37mm. The stamps show photographs by Alexi Lubomirski (c) Kensington Palace. Postmarks available for the day of issue will be shown in Royal Mail's Postmark Bulletins (download here).